There’s nothing quite so impressive as a whole roast turkey brought to the table for carving. It’s almost guaranteed to elicit oohs and aahs from your dinner guests. It certainly did back in Rome when we prepared Thanksgiving dinner for our Italian friends. A whole turkey was a rare thing there. Turkey parts, on the other hand, are a common feature of Italian cooking. And for everyday cooking—or holiday cooking for a smaller group—it’s a more practical choice. This recipe for a colorful Oven-Roasted Rolled Stuffed Turkey Thigh makes for a wonderful Thanksgiving dinner or Sunday dinner any time of year for a small family or gathering of friends. Perhaps it’s not quite as impressive as a whole roast turkey but surely every bit as festive. While the dish isn’t all that difficult, you do need to proceed in steps. You begin by deboning, skinning and butterflying your turkey thigh. Then you prepare your filing by making frittatine (“little frittatas” that look much like crepes) and sautéing spinach. 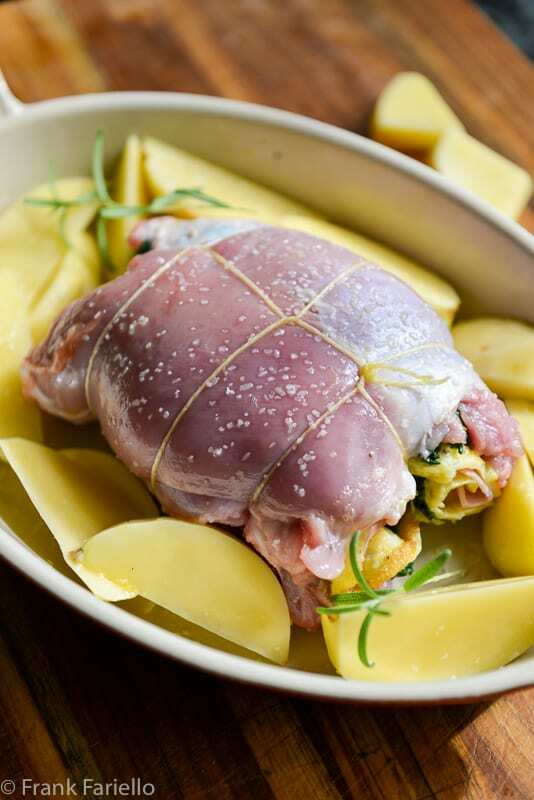 Then the filing ingredients are placed over the thigh, which is rolled and tied, before roasting in the oven for. an hour. The roast is left to rest before slicing and serving. The roast at the moment looks rather a mess, but no worries. Make sure this messy “inside” of the thigh is face up and all will be well in the end! Prepare some frittatine (little frittatas) by whisking together the eggs, cheese, salt and pepper in a bowl. Heat a little oil and/or a knob of butter in a small non-stick skillet over moderate heat and pour in one small ladleful of the egg mixture—just enough to cover the bottom of the skillet. Let the egg set on one side, then flip it over to set on the other side, as if you were making a very thin, crepe-like frittata. The eggs should brown only very lightly. Wash the spinach well, then, while it’s still wet, add it to a large saucepan over moderate heat. Let the spinach cook just until wilted. Remove the spinach from the saucepan and run it under cold water to stop it cooking, then squeeze it dry. Chop the spinach finely and then add it to a skillet, where you will have lightly sautéed a clove of garlic in olive oil and then removed it. Let the spinach absorb the flavor of the garlic-scented oil for a few minutes, seasoning it with salt, pepper and just a soupçon of grated nutmeg. Turn off the heat and let the spinach cool. Rub the whole roast with with olive oil, then season it generously with salt and pepper. Lay the roast in a roasting pan, which you will have greased with olive oil, seam-side down. Arrange some potatoes around the roast if you like. Drizzle everything with some white wine. Roast in the oven at 190C/375F for about an hour, basting with some more white wine from time to time, until the roast is cooked through and nice and golden brown on the outside. If in doubt, insert a meat thermometer into the bottom of the roast; the temperature should read 74C/165F. At this temperature the meat will be perfectly safe to eat but still nice and juicy. Let the roast rest for at least 15 minutes. Then cut the roast into 1cm/1/2 inch slices and serve, along with any juices in the roasting pan. Here’s one important tip: If you’re tempted to skimp on the rest period after roasting and before slicing, resist it. The rest is crucial. If you slice the roast as soon as it comes out of the oven, it’s likely to fall apart. The longer you let it rest, the more solid it will be. In fact, the roast is perfectly delicious at room temperature, although I do prefer it while it’s still warm. It goes perhaps without saying, but you can mix and match the stuffing ingredients to match your tastes and moods. Swiss chard instead of spinach, for example. Or prosciutto or mortadella instead of cooked ham. I haven’t tried it yet, but I suspect some sautéed mushrooms would be a nice addition, too. The potatoes are optional, of course. If you choose to add them to the roasting pan, they are likely to soak up most if not all of the pan juices. But that’s the price you’ll pay for very tasty potatoes. Either way, don’t throw out those juices! If they’re too abundant, you can reduce them on the stove while the roast is resting. If they’re not abundant enough, you can stretch them by adding some white wine or broth to the roasting pan again on the stove—a good idea anyway, so as to deglaze that delicious fond off the bottom of the roasting pan. If you prefer turkey breast to the thigh’s dark meat, this recipe should work well for a butterflied half breast, doubling the measurements for the stuffing ingredients since the average breast weighs about twice the average thigh. The cooking time should be about the same, however, since the breast cooks more quickly than the thigh. 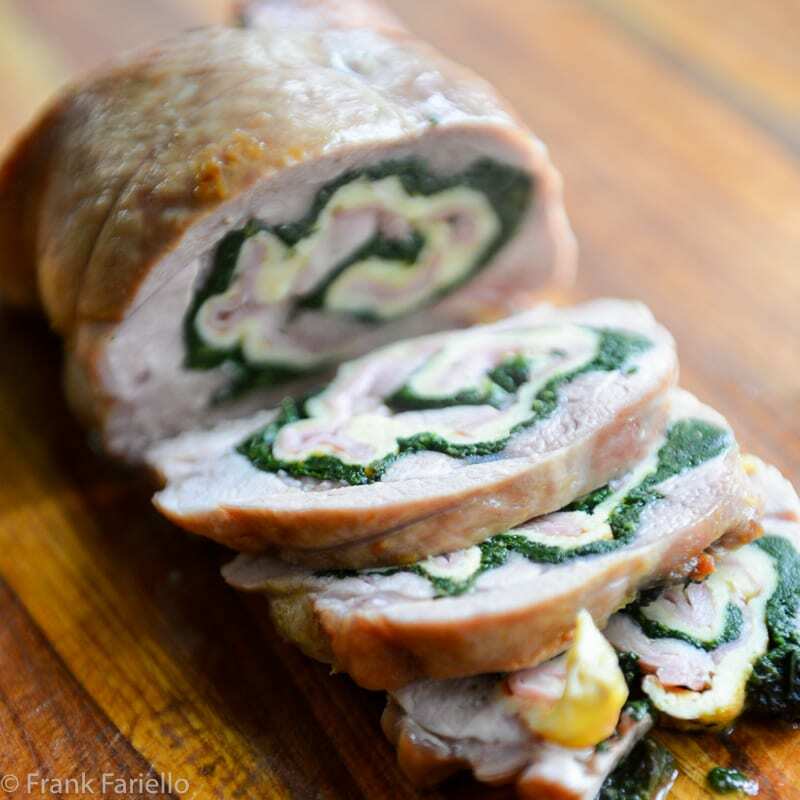 Or try this recipe for a similar rolled roast made with turkey breast stuffed with seasoned spinach. If the thigh isn't already boneless, cut the thigh bone out, then cut the thigh down the middle so it opens up like a book. Make a few incisions between the muscles along their seams if need be so as to flatten out the thigh. Remove the skin as well if it isn't already skinless. Lay some parchment paper over the thigh and pound it lightly with the back of a skillet to flatten it a bit more. The roast at the moment looks rather a mess, but no worries. Make sure this messy "inside" of the thigh is face up and all will be well in the end! Wash the spinach well, then, while it's still wet, add it to a large saucepan over moderate heat. Let the spinach cook just until wilted. Remove the spinach from the saucepan and run it under cold water to stop it cooking, then squeeze it dry. Chop the spinach finely and then add it to a skillet, where you will have lightly sautéed a clove of garlic in olive oil and then removed it. Let the spinach absorb the flavor of the garlic-scented oil for a few minutes, seasoning it with salt, pepper and just a soupçon of grated nutmeg. Turn off the heat and let the spinach cool. Now starting at one of the short ends, roll the turkey thigh up as tightly as you can manage. 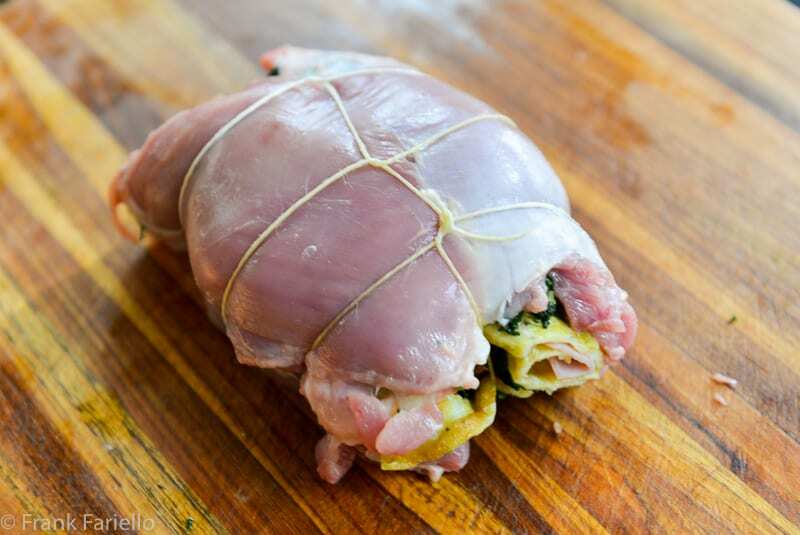 Tie the roll with cooking twine. Rub the whole roast with with olive oil, then season it generously with salt and pepper. Lay the roast in a roasting pan, which you will have greased with olive oil. Arrange some potatoes around the roast if you like. Drizzle everything with some white wine. I love this just for Paul and me. I generally like to keep a turkey around for the winter. (I am more turkey breast than thigh but who cares?) Bonus: it is pretty and festive – which gets more and more important as the winter slogs on. Indeed, a little festivity helps you get through the cold, dark evenings of winter. That, and a little eggnog… ? That is just gorgeous! And I love the swirliness of the layers! Happy Thanksgiving! I love the layers as well! 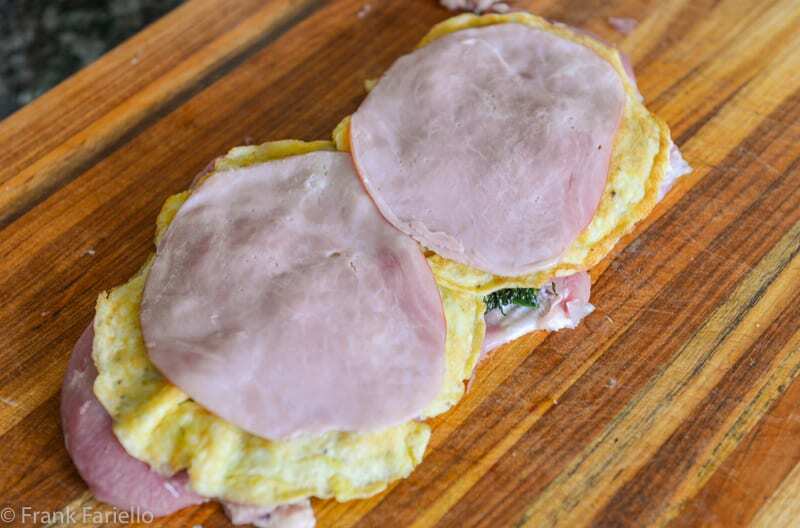 Quite an interesting technique to make small omelettes to incorporate into the involtini. An idea I will steal and use over and over in other dishes. Have never been a turkey lover tho’, in pieces, it is freely available throughout the year Down Under. Something tastier and less dry has always won the day ! Am very drawn by your method and I have always chosen dark meat over the ‘boring’ breast: this looks appetizing and will taste so too – next time I have just a few for dinner . . . no holidays needed . . . Happy Thanksgiving to you and yours tho’ ! A great dish and worthy of a repeat. I love the way this dish plates. The combination of the pink of the turkey leg, green of the spinach and the yellow of the frittatine gives the dish a lovely contrast of colors. Here in Sweden a whole turkey is rare and bloody expensive. We have broken down parts in our markets as you did in Italy, but a boneless thigh goes for around 350kr/kg or $17.50/pound. This is a dish I’d like to try, perhaps for the two of us on Christmas Eve. Thanks, Ron! Turkey thigh round here is actually pretty reasonable, much more so than the breast, which is very pricey. For whatever reason most people here prefer the breast, even if to me it’s rather insipid. Personally I like the thigh a lot more, so I consider myself lucky! I am making this for Easter dinner-along with your wonderful pasta and red onion/anchovy dish. Of course there’ll be ham and potatoes Gruyere, but I think the turkey thighs will be a biggger hit. I make stuffed, rolled thighs for Thanksgiving with a spinach, Parmesan, sausage and Italian bread stuffing, and to me, they taste better than the turkey breast. I’m with you, Dolores. There’s typically more meat on the breast (these days at least) but the thighs are much tastier. This is absolutely gorgeous! I’m so glad you posted it! Fantastic! This is perfect for a Sunday meal with the family as well as the main dish if you’re having people over. Can’t wait to try this one dear Frank, thanx so much!!! And thank you for your comment, guys! che bontà! It reminds me of many Sunday lunch! I will definitely be trying something like this for Christmas! I love the slice with the different layers and colours! Thanks, Marcellina. I like those colors, too. This looks so delicious and festive, Frank. I love the addition of the frittatine, something a Roman friend of mine used to do too. Happy Thanksgiving. They are very pretty, aren’t they? Frank, your timing is brilliant! We won’t have our own turkey this year because we are dining with friends. However, we love having a little turkey around – especially the dark meat! We just called the butcher and ordered two boneless skinless turkey thighs so that we can make this after Thanksgiving. Can’t wait to try it out – I’ll report back. Dark meat lovers unite! Will be curious to hear your reaction to this recipe, David. I’m not a huge turkey fan, but the thigh is definately my preferred part. This is a most elegant way in which to prepare turkey and certainly delicious. Wonderful any time of year and so versatile. Wishing you a wonderful Thanksgiving Frank. I have another twist on this which I taught in culinary school. Use the whole leg and peel skin back to the knuckle. Break off the leg bone from the knuckle. 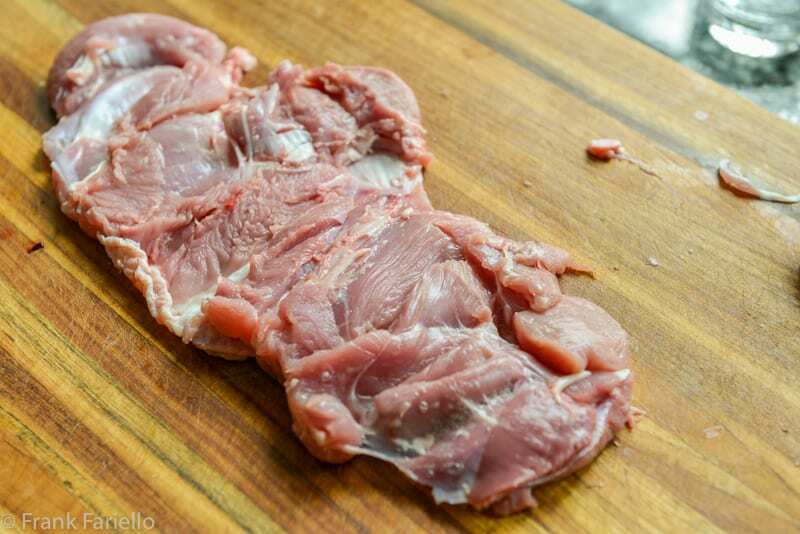 Make a mock version of cotechino sausage from the leg an thigh meat. Stuff back into the skin and secure skin with a skewer. Roast until done and slice. Sounds really nice, Tom. I actually was thinking of roasting the whole leg this year, but couldn’t find one. I love the dark meat; it is high in iron, and turkey is so lean that one need not worry about it being a bit “richer” than the white (fortunately the ultra-low-fat diets of the 1980s are passé for most people’s health). This is a wonderful recipe. I’m thinking of alternatives for guests who don’t eat pork – I think some roasted red peppers might be an idea, as well as the mushrooms, and herbs. There is a very good poultrerer nearby (beside Jean-Talon Market); Zinman’s was started by Eastern European Jewish poulterers many decades ago, but now the branch near me is Italian-owned, and the original one a bit south of here is Portuguese-owned! They have very flavourful turkey parts. Turkey meat was a staple at the mensa universitaria when I was studying in Italy; actually much better than one might think. I’m with you. Turkey is too good to eat just once a year. I would certainly ooh and aah over this! It looks delicious and I’ve already pointed your recipe out to Hubby. We eat turkey throughout the year and this would be a great Sunday dinner. My mamma never made a whole turkey. She always boned it out , used the bones to make broth, and roasted the turkey covered in thinly sliced onions, salt and pepper, and butter. Oh!! It was so good. We do the same for our family. I like the sound of that recipe, Marisa. You should post it on your blog—if you haven’t already perhaps? What an elegant presentation for turkey thighs. Perfect for an intimate dinner. Have a wonderful Thanksgiving! People shy away from turkey dark meat and I don’t know why. I love dark meat and this dish looks great! I’m with you, Ben. Dark meat has so much more flavor and stays juicy. But hey, different strokes… And it just means more dark meat for us! Perfectly sized for my little family ! Thank you and enjoy the holidays! What a beautiful and unique presentation for Thanksgiving dinner, Frank! It is really perfect for a small gathering. I would definitely enjoy this, but more so with the breast as you described for those who aren’t dark meat fans.